Servicio Nacional de Geología and Minería (SERNAGEOMIN) Observatorio Volcanológico de Los Andes del Sur (OVDAS) reported that beginning at 1524 on 15 February a seismic swarm at Lanin, consisting of 59 volcanic-tectonic, long-period, and spasmodic tremor events, lasted for 45 minutes. The largest volcano-tectonic event was a M 1.8. The Alert Level was raised to Yellow (second highest level on a four-color scale); ONEMI declared an Alert Level Yellow (the middle level on a three-color scale) for the community of Curarrehue (32 km N). The Global Volcanism Program has no Bulletin Reports available for Lanín. 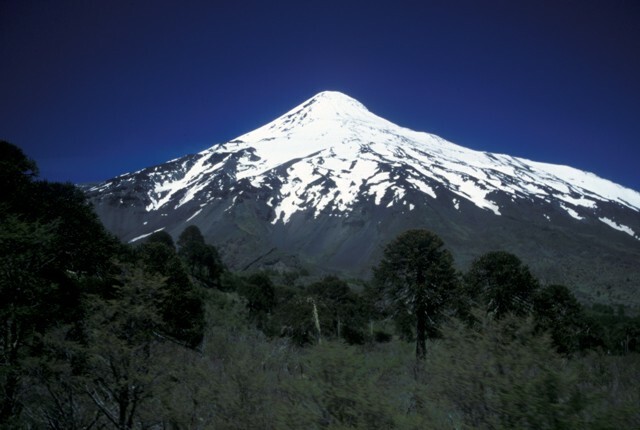 Lanín is a large conical late-Pleistocene to Holocene stratovolcano along the Chile-Argentina border. 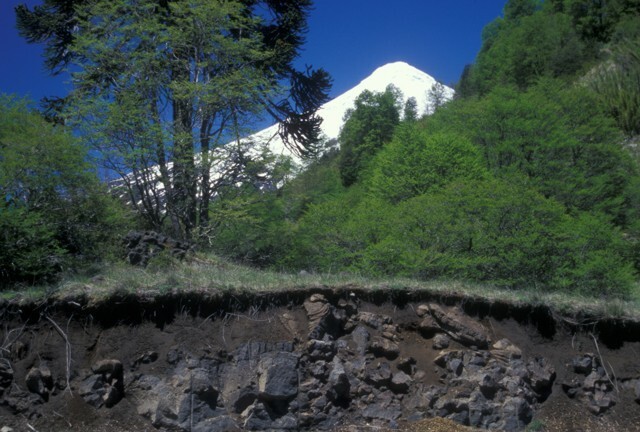 The dominantly effusive basaltic-to-trachydacitic volcano lies at the eastern end of a NW-SE-trending volcanic group beginning with Villarrica that is transverse to the Andean chain. The beautifully symmetrical, 3776-m-high Lanín rises 2500 m above its base; shoulder areas on the upper flanks hint at a buried caldera. The volcano was formed in four eruptive stages dating back to the early Pleistocene or late Pliocene. The last two stages occurred during the late-Pleistocene and Holocene. A small lava dome at the summit fed blocky lava flows to the north about 2200 years ago. Lanín was reported active after an earthquake in 1906, but Sapper (1917) stated that newspaper accounts are strongly disputed, and no historical eruptions are known. A postglacial tuff ring (Volcán Arenal) is located below the SW flank in Argentina. A younger lava flow from Lanín covers deposits of Volcán Arenal and extends south into Lago Paimún. Corbella H, Susana Alonso M, 1987. Post-glacial hydroclastic and pyroclastic deposits in the Lanin National Park, north Patagonian cordillera, Nequen, Argentina. Andean Volc Internatl Symp, Tucaman, Argentina, 9 p.
Lara L E, Naranjo J E, Moreno H, 2004. Lanin volcano (39.5° S), Southern Andes: geology and morphostructural evolution. Rev Geol Chile, 31: 241-257. There is no Deformation History data available for Lanín. There is no Emissions History data available for Lanín. 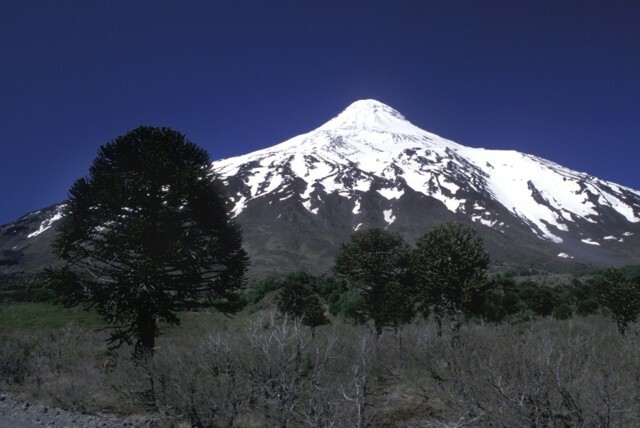 Volcán Lanín is a large conical late-Pleistocene to Holocene stratovolcano along the Chile-Argentina border. The beautifully symmetrical, 3737-m-high Lanín, seen here from the Chilean side, rises 2500 m above its base. A small lava dome at the summit fed blocky lava flows to the north. A postglacial tuff ring (Volcán Arenal) is located below the SW flank of Lanín in Argentina. A younger lava flow from Lanín covers deposits of Volcán Arenal and extends south into Lago Paimún. No reliable reports of historical eruptions from Lanín are known. Photo by John Davidson, University of Michigan (courtesy of Hugo Moreno (University of Chile). Quetrupillan stratovolcano (left) lies at the center of a group of three volcanoes trending transverse to the Andean chain. It is seen here from the summit of Villarrica volcano (at the western end of the chain), with conical Lanín volcano at the eastern end in the background. The 2360-m-high Quetrupillan volcano was constructed within a large 7 x 10 km wide caldera; a smaller caldera truncates the summit. Some of the most recent activity produced pyroclastic cones along the right-hand flank, near the SW margin of the older caldera. Photo by Judy Harden, 2004 (University of South Florida). The lava flow in the foreground roadcut is part of the Quillelhue Basalts, which were erupted from an area at about 2600 m altitude on the NNW flank of Lanín, the snow-capped volcano in the background. The lavas form a basaltic field that reaches as far as Quillelhue Lake, more than 5 km from their source. The flows are bracketed by 2170 BP date for the Mamuil Malal dacitic block-and-ash flow and a 1650 BP date for an overlying pyroclastic-flow deposit. Photo by Lee Siebert, 2004 (Smithsonian Institution). 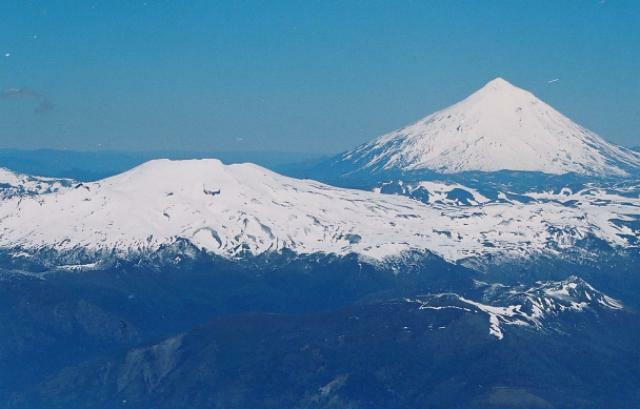 Snow-capped Lanín volcano rises to the SSW above the Chile/Argentina border. A grove of distinctive Araucaria trees ("monkey puzzle trees") occupy the foreground. These distinctive trees are one of Chile's most renowned conifers and are confined to restricted areas in the Andes. Fossils reveal that this genus was once extremely widespread, leaving behind petrified woods in Arizona and amber deposits around the globe. The Auracaria occurs today only in Chile, one small region in Brazil, a few places in Australia, and New Caledonia. Lanín volcano rises to the south above a grove of distinctive Araucaria trees near the Chile/Argentina border. The beautifully symmetrical, 3737-m-high Lanín towers 2500 m above its base. The prominent shoulder area on the upper western (right horizon) and northern flanks hint at a buried caldera. 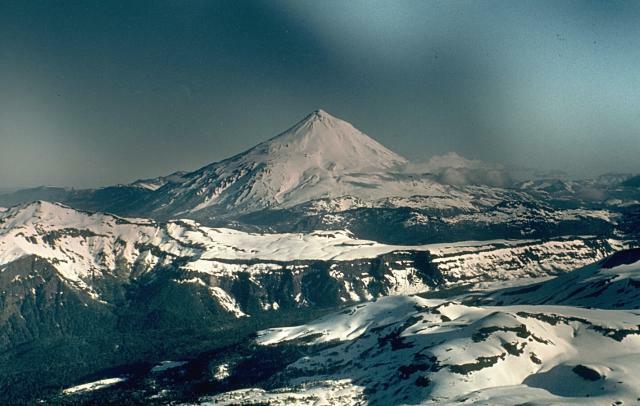 The volcano was formed by dominantly effusive basaltic-to-trachydacitic eruptions at the eastern end of a NW-SE-trending volcanic group beginning with Villarrica on the west that is transverse to the Andean chain. There are no samples for Lanín in the Smithsonian's NMNH Department of Mineral Sciences Rock and Ore collection. Large Eruptions of Lanín Information about large Quaternary eruptions (VEI >= 4) is cataloged in the Large Magnitude Explosive Volcanic Eruptions (LaMEVE) database of the Volcano Global Risk Identification and Analysis Project (VOGRIPA).